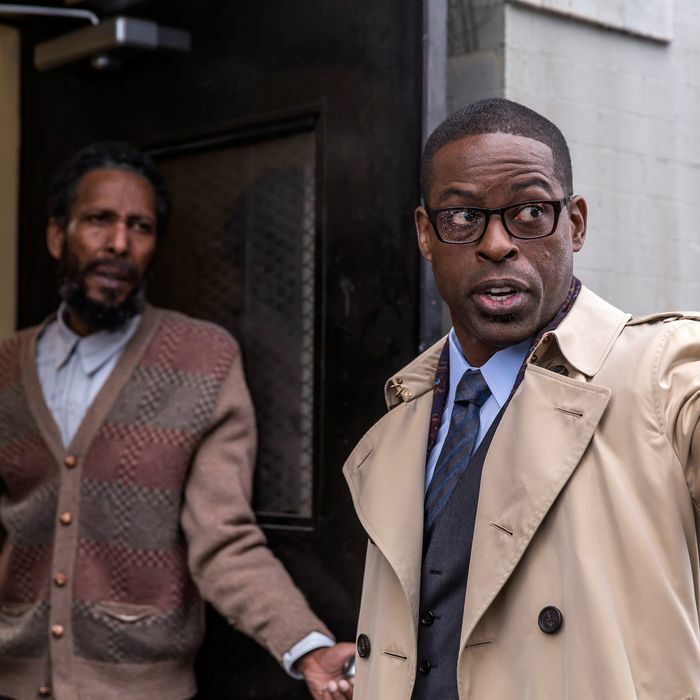 Ron Cephas Jones as William, Sterling K. Brown as Randall. Much has been said about This Is Us since its tear-jerking trailer was released in May: It is fall’s most anticipated new series. It is the new Parenthood. It has the power to make you weep into your overpriced decorative pillows as you’re laid low by the thought that all human beings are connected but alone, and also isn’t it unfair that Mandy Moore has never been the lead in a TV show before? Okay, so that last one was just me, but that doesn’t make it any less true. I’m happy to report This Is Us lives up to the hype. Sure, I have some questions now that we’re all hip to The Twist that connects its characters, but I trust the show will be fine. Over the course of its first hour, series creator Dan Fogelman and his spectacularly well-lit ensemble make it hard not to feel immediately invested. In an effort to set up story lines for the main players and make the big reveal, the pilot splits screen time evenly for each character (except for Randall’s hilarious daughters, who deserve much more). What’s remarkable about this episode is that even with those time restraints, the characters already feel lived-in and multidimensional. I believe they each have a history. Most important, I want to know more about them. That’s a tall order, and that’s where This Is Us excels. Enough gushing, though! Let’s get to know the characters who will give our tear ducts a workout every week. Meet Jack (Milo Ventimiglia) and Rebecca (Moore). They’re celebrating Jack’s 36th birthday with a traditional cupcake striptease (traditional for them, at least), until that dance is cut short when Rebecca, pregnant with triplets, goes into labor. To make a high-risk delivery even more complicated, their doctor can’t make it. Their replacement doctor, played by the wonderful Gerald McRaney, turns out to be the best thing to ever happen to them, and probably to America too. Seriously, we all need Dr. K to hold us and tell us everything is going to be okay. He’s so good at that. A comforting hug is exactly what Jack and Rebecca need. No matter how optimistic Jack wants to be, no matter how often he insists that Dr. K knows they have three cribs waiting for three babies at home, the delivery takes a turn for the worse. In the end, only two of the triplets survive — a boy and a girl. 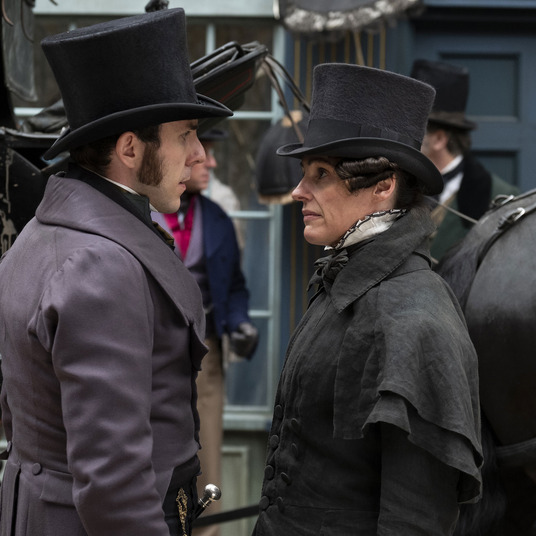 In the best scene of the episode, Dr. K comes out to give Jack the bad news. Utterly stunned, Jack has to be told twice just to process it. Dr. K confesses that he and his late wife lost a child when they were younger, and he’s carried that loss with him through five decades of delivering babies. He relays his story in the hopes that, one day, Jack will be an old man telling someone else about how life handed him the sourest lemon and he still made something resembling lemonade. I literally put my hand on my heart several times throughout this scene. Even in an episode full of some great moments, this one stands out. Meet Kevin (Justin Hartley) and Kate (Chrissy Metz). They’re siblings, and like Jack, they’re celebrating their 36th birthday. They’re both very down about the whole thing. Kevin would have you believe that his existential shadow is linked back to the Challenger explosion — and it’s great to see Kate shut down a theory she’s no doubt heard dozens of times — but in reality they are both simply feeling unfulfilled. Kevin is the star of a successful sitcom, The Manny, in which his acting range has been shrunk down to “shirt on” or “shirt off.” He finally nails a scene with a little more heft to it (oh, hey, Alan Thicke! ), but it is quickly cut for a lighter version. Kevin goes full Jerry Maguire in front of a live studio audience, slamming the vapidness of the show and its viewers who keep it on the air. He quits in a huff. After video of the meltdown goes viral, Kevin gets very drunk and runs into his sister’s arms, fearing that he’s not any better than The Manny and that he just tanked his career. Lest you think Kevin is as shallow and flighty as The Manny, it’s clear he cares about Kate more than anything else in this world. Even though he’s sandwiched between two attractive gals at a Hollywood party, when his sister calls after falling off her scale and twisting her ankle, he immediately jumps to her rescue. Kate’s dealing with self-esteem and weight issues, and although she wants Kevin to give her some tough love, he says all the right things. The pairing of Justin Hartley and Chrissy Metz is the biggest, most welcome surprise of the hour. They’re lovely together. While Kevin is busy being an ungrateful host to Alan Thicke, Kate is making good on her promises. She heads off to a support group, full of people with their own weight issues. It’s here she meets Toby (Chris Sullivan). He spots her giggling at some of his off-color jokes during the meeting, then asks (and asks and asks) if she’ll go out on a date with him. Is everyone else swooning already over Toby? The guy has game. He’s funny, he handles Kate’s heartbreak like a pro, and he has a crush on Sally Field. When he plants a big ol’ kiss on Kate before tending to her drunk brother, I felt the butterflies. Toby and Kate 4Eva! Meet Randall (Sterling K. Brown). Oh, hey, Randall’s also turning 36 today! He’s a very successful lawyer type. We know this because his large office is sparsely decorated and he has giant windows that overlook the city skyline. On his birthday, Randall receives news that the P.I. he hired has finally tracked down his father, an addict who left him at a fire station after Randall’s mother died during childbirth. Randall decides to knock on the guy’s door and give him a piece of his mind. Of course, he also mentions that he was raised by two wonderful parents, has a family of his own, and a very expensive car to boot. Randall wants to drop the mic and storm off, but something about William renders him powerless to all normal behavior. Instead, he goes inside, listens as William admits that he barely remembers abandoning his child, and ultimately invites the recovering addict to meet his grandkids. Newly minted Emmy winner and certified dreamboat Sterling K. Brown really sells the tricky aspects of this story line. Just look at Randall’s bewildered face when he realizes he wound up bringing William into his home. Or the prideful defensiveness in his voice when he talks about his adoptive parents being at the hospital that day, how they realized he was meant to be theirs. Or the anger and heartbreak in his eyes when he learns that William only has a few months to live. Yeah, this guy is good. Finally, meet The Twist. After Dr. K’s speech, Jack heads over to the nursery to meet his kids, and there he runs into … a firefighter dropping off an abandoned baby boy. While Jack looks at the newborn lying next to his son and daughter, Kate reminds Kevin of the advice their dad used to give them while growing up. Something involving a sour lemon and lemonade. Back at the hospital, the firefighter offers Jack a cigarette and the camera pans out to reveal everyone is dressed in late-’70s garb. Jack isn’t just a bearded hipster with an affinity for denim! We’ve been jumping back and forth between two timelines! Kevin, Kate, and Randall are living in the present day. When they were born 36 years ago, they became Jack and Rebecca’s big three. How do things work from here? Are Jack and Rebecca going to pop up in the present day or are they gone already? Will I ever be able to get that song that plays over the final montage out of my head? The answer to all three questions is: I don’t know, but I’m hooked.